Welcome to my blog, and my first post, ever! I can’t say for sure how often I’ll be writing, but when I do it will be all about doggie things. Maybe stories and updates on dogs that I’m training, a reflection on a day’s walk, events, occasional how-to articles, and anything else that comes to mind about our four-legged friends. I hope you enjoy. And so my first post is to tell you about an upcoming event – a CHARITY DOG SHOW at Chenies Manor House, Bank holiday Monday 25th May, 1:30 – 5pm. The show is being organised by Chorleywood Dog Training in aid of The Dogs Trust and Glendee Rescue. It looks like a lot of fun. 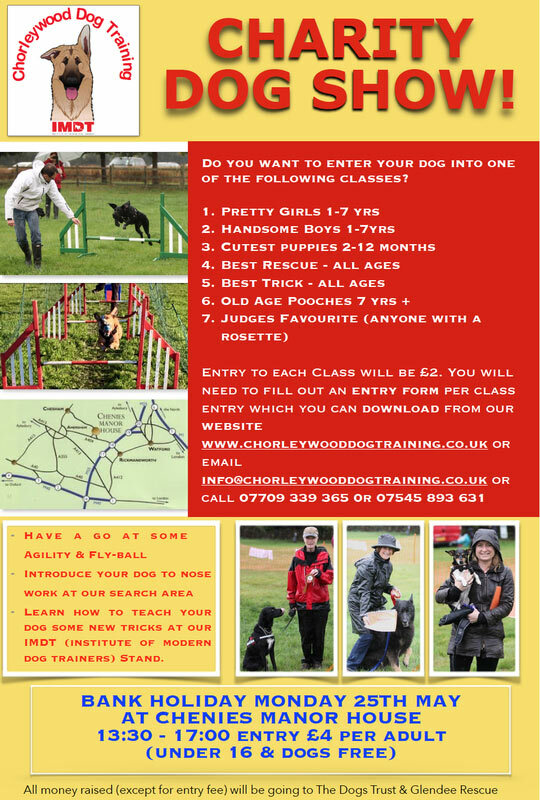 There are seven classes you can enter your dog into, from prettiest girl to most handsome boy, cutest puppy, best tricks, best rescue, old age pooches and judges favourite. I’ll be there participating in an introduction to scent work so if you come along do say Hi!